(Nanowerk News) What if one day, your computer, TV or smart phone could process data with light waves instead of an electrical current, making those devices faster, cheaper and more sustainable through less heat and power consumption? That’s just one possibility that could one day result from an international research collaboration that’s exploring how to improve the performance of plasmonic devices. The research led by Masoud Kaveh-Baghbadorani, a doctoral student in the University of Cincinnati’s Department of Physics, will be presented on March 5, at the American Physical Society Meeting in San Antonio, Texas. 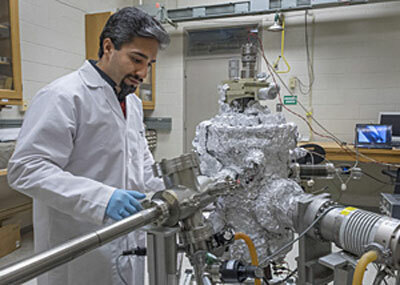 Masoud Kaveh-Baghbadorani, a doctoral student in UC's Department of Physics, conducts research to improve the performance of plasmonic devices. The researchers are investigating the manipulation of light in plasmonic nanostructures using the dephasing and population dynamics of electron-hole-pairs in metal coated, core-shell semiconductor nanowires. The technique would minimize energy loss and heat production. The research focuses on guiding light through nanometer-thick metal films – about a thousand times thinner than a human hair – to propagate light with plasmon waves, a cumulative electron oscillation. Plasmonics is an emerging research field, but it has limitations due to high resistivity losses in the metal films. Kaveh-Baghbadorani has been exploring the development of hybrid metal/organic semiconductor nanowires that work as an energy pump to compensate for energy losses in the metal coating. Masoud Kaveh-Baghbadorani conducts research in a UC lab in partnership with the Australian Research Council to improve the performance of plasmonic devices. In addition to using a different metal, the researchers are also using a vertical alignment of nanowire structures. They also developed a method to completely surround the nanowires with layers of 10-nanometer-thick gold films. An inserted organic material works as a spacer layer to control the energy transfer from the nanowire into the metal. The research is also exploring the effect of using different organic spacer layer thicknesses on the energy coupling. Future applications could include faster and enhanced performance of computers and other smart electronic devices, solar cells or even lead to a super-lens that results in a vast improvement of the current generation of microscopes. “We’re far from being at the end of potential applications for this research and constantly thinking about new uses. The research field is extremely rich, there’s no end in sight,” says Wagner.